We are spending this month being thankful to Y-O-U! Our customers are the reason we are able to do what we love… feeding kids the food their body needs to help them flourish at school and on the field. Healthier kids perform better on tests, are more focused in class, behave better, are absent less and have higher self-esteem. Some studies have shown that a healthy diet in the first 3 years of life dramatically affects a child’s IQ. Since students get most of their physical activity and eat and drink as much as half of their total calories at school, a balanced school lunch is an important part of a healthy kids’ diet and a great place to make a difference in your child’s health. You can read more about these studies here on our STUDIES blog. Gratitude Jar: Have family members write down what they’re thankful for each day on a piece of paper, and place them into the jar until Thanksgiving Day. Then the family pulls them out to look back on the moments and events, big and small, that inspired gratitude. Cut small pieces of patterned paper to use as cards, or print classic blank notes. 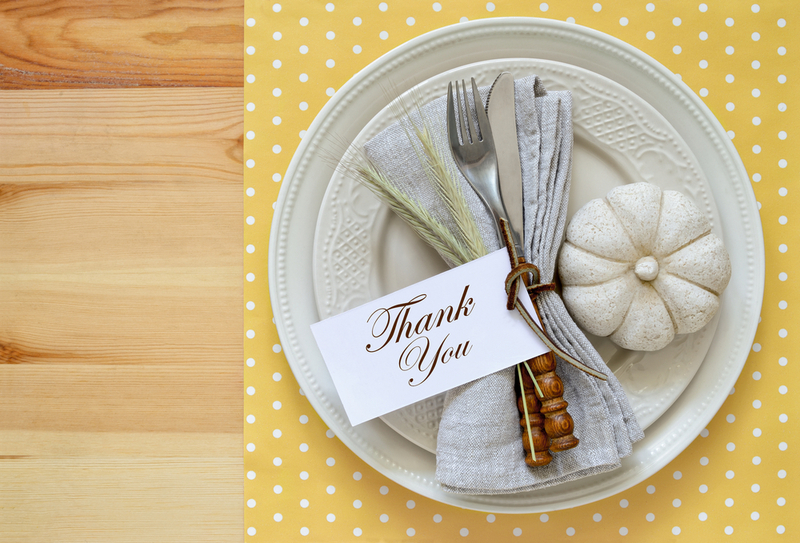 Gratitude Table: Buy a colorful pack of markers (washable), and a onetime use table cloth so that your family can write/draw what they’re grateful for all over your Thanksgiving table… and keep the kiddos occupied too! We hope you and your family have a healthy and Wholesome month!